History, Characteristics, Architecture, Sculpture, Painting. The first major movement of Medieval art, the style known as "Romanesque" can be used to cover all derivations of Roman architecture in the West, from the fall of Rome (c.450 CE) until the advent of the Gothic style around 1150. Traditionally, however, the term refers to the specific style of architecture, along with sculpture and other minor arts that appeared across France, Germany, Italy and Spain during the 11th century. Richer and more grandiose than anything witnessed during the era of Early Christian Art, the Romanesque style is characterized by a massiveness of scale, reflecting the greater social stability of the new Millennium, and the growing confidence of the Christian Church in Rome, a Church whose expansionism set in motion the Crusades to free the Holy Land from the grip of Islam. Later, the success of the Crusaders and their acquisition of Holy Relics stimulated further construction of new churches across Europe in the fully fledged Romanesque style of architecture (Norman architecture in Britain and Ireland). In turn this building program produced a huge demand for decorative religious art, including sculpture, stained glass and ecclesiastical metalwork of all types. By the 12th century certain architects and sculptors had become highly sought-after by ecclesiastical and also secular patrons. Morgan Library & Museum, New York. Between Romanesque and antique art there is an interval of many centuries, during which the Northern tribes made their entry into history. This period of folk migration is one of prehistoric arts and crafts, which are well known. Various discoveries of golden ornaments and coins show the long route followed by the Germanic tribes in their journey from the East into France and Spain. The careless and simple beauty of the jewellery of the Merovingian King, Childeric, who died in 481, betrays the influence of classical traditions, which were not, however, just feebly accepted, but adapted in a masterful way, often without full understanding. The Merovingian period was not a bridge between antiquity and the Middle Ages; it produced no late flowering of the ancient culture and literature, such as Gothic Roman culture did in the writings of a Cassiodorus or a Boetius. After Theodoric the Great had secured a leading position by alliances with all the Germanic states, it seemed at first as though Rome, under Gothic rule, would peacefully combine the old and the new; but the Merovingians, under Clovis, made this impossible. In the East, Byzantium was able to hold out for some centuries only because she could draw upon the hardy highland peoples of the Balkans and Asia Minor. In western Europe the centre of evolution moved northwards, for there were its new sources of energy. The old Viking decorative art is often discussed and described, but is usually misunderstood: emphasis is always laid on the interlacing straps or ribbons, the knots and loops, and unconvincing attempts are made to relate these to the technique of weaving. But more important than their ultimate origin is their autocratic disdain of symmetry, their avoidance of geometrical forms, and their restless, undisciplined energy. If one wanted to invent a new art to express an age of restless transition, one could imagine nothing more appropriate than this, which never derives its motives from geometry, but always creates a living and organic pattern. In the illuminated manuscripts of the early Christian period, in particular those of the Irish and the Anglo-Saxons - peoples who as early as the fifth century had their Christian churches and monasteries - the spiritual character of this new art is clear. Thanks to the far-reaching missionary activities of the Irish monks, we have not only such priceless illuminated manuscripts as the Book of Durrow and the Book of Kells, but also manuscripts with richly illuminated initials from such Continental centres as St Gall, Paris, Toulouse, and Laon. This art of Northern and Eastern Europe includes lively trellis-work and animal motifs, visible in the miniatures of its manuscripts, or the ornamental metal-work of tools and weapons, or its brooches - the so-called fibulae. Only the West is still faithful to the style of the Byzantine and Armenian miniatures, but without succumbing to hieratic stylization, indulging rather in the unruly, vital fantasies of the Age of Migration. In their architecture, on the other hand, they were more influenced by the forms of Roman art; indeed, this architecture was at first a synthesis of antique prototypes, rather than a new creation. The tomb of Theodoric the Great in Ravenna; Charlemagne's chapel in Aix, built on the model of the church of San Vitale, and consecrated in the year 805; or the Carolingian gatehouse at Lorsch, are various stages in the acceptance of these traditional forms, which the new rulers adopted with delight. Thus the whole of the Carolingian period, from 700 to 900, must be regarded as pre-Romanesque, and in a certain sense as a survival of antiquity. About 1000 CE the influence of Christianity had spread to all parts of Europe. Although the course of history, during this process, was not untroubled, and although the Middle Ages were disturbed by violent conflicts between Emperor and Pope, and by the Crusades, yet one cannot fail to realize the power and the unity of the feelings quietly at work behind the turmoil. Followers of a faith which taught them to worship the Sun as the life-giving Power and personified the forces of Nature as gods, yet fearing life in spite of all their magic, the heathens encountered the Christian philosophy. It seemed to them that there was great magic in the Christian scriptures, and they painted the letters as living creatures. Knowledge of Latin taught them the values of a high and ancient civilization, to which they dedicated their unspoiled energies. For these peoples Christianity was not a refuge for the weary, but a new assurance of life, an ordering of the universe such as they had not found in the old doctrine. Since there was a Judge in heaven, who looked into the hearts of mankind, and since the new faith told them, even to the least particulars, what was right and wrong, the young Christian could really look up to God as to a loving father in heaven. Only the general piety can explain the fact that the influence of authority was often incredibly disproportionate to its power. While one cannot find a common denominator for the infinitely rich and varied life of many centuries, yet the Romanesque world does seem to be one vast commmunity, united by Christianity. The Middle Ages have been called a night lasting almost a thousand years; but the night was bright with stars. In spite of the universal religious control, Romanesque, and much later, Gothic man, was able to realize his individual personality. Art needed powerful stimuli; at first there were churches and monasteries, then universities and religious orders, and finally states, cities, and individual patrons. The result of all these various forms was that little remained of the antique forms, apart from the ornamental motifs. The unifying sense of Romanesque art appears in the intimate union of poetry and music; metrical accentuations, and, above all, the rhymes, indicate the revival and independence of the sense of rhythm, to which the Latin quantitative metre had become unintelligible. The founders of the monastery of Cluny, at the beginning of the tenth century, reformed the rules of the Benedictine Order in accordance with the spirit of the times, threw off the last traces of Byzantine stiffness, and established a spiritual order, above political confusion and threatening social dissolution, which made war upon ignorance and immorality and provided a refuge for scholars. This combination of religious idealism with organizing ability gave life a purpose; what remained after the disintegration of the Carolingian empire, which had been too closely wedded to antiquity, had now to find its place in the new religious community, which laid down the future conditions of European civilization. For everyone a spiritual attitude was prescribed, to which the individual was subordinated, and which was maintained in the peasant's hut as well as the king's court, in the monastic cell no less than in the bishop's palace. Only thus could such a personality as Bernard of Clairvaux, a simple abbot, not only govern the Cistercian Order for a whole generation, but rule the destinies of the entire Western world. The finest expression of this monastic piety was the Romanesque style. In Romanesque religious architecture practical considerations were gradually superseded by aesthetic; from the outwardly simple meeting-house of the Christian basilica, the church, even in its external aspect, became a majestic monument. The individual parts of the early Christian basilica survived the longest; but the whole aspect of the structure very quickly changed. The ratio of height to width, which in early Christian art were approximately equal, increased until the nave was sometimes twice as high as the building was wide. The bell-tower, the campanile, which had hitherto stood by itself, now moved up against the body of the church, which often had two such towers. At first the twin towers were built on either side of the fascade, while the ground-plan assumed the form of the Latin cross, with a transept coming between the chancel and the nave. The crossing of nave and transept was crowned by a dome or a tower. In the apse, where the choir stood, there was too little room for the clergy, always very numerous in the great monastery churches; so the nave was continued beyond the crossing, providing a chancel for the choir. As a rule this was shut off from the nave and the transepts by stone barriers or screens, and the screen facing the nave often contained a sort of platform, the lectorium or lectern, from which the Gospels were read. When wooden roofs, still very usual in the Romanesque churches, were abandoned - often for practical reasons, and on account of the danger of fire - in favour of vaulted roofs, the crossing of nave and transepts determined the whole ground-plan of the Romanesque basilica. On account of the strong lateral thrust the semi-cylindrical barrel vaulting was seldom adopted, but preferably the crosssvaulting which had already been used by the Romans for covering wide spans. This cross-vaulting is produced when two barrel-vaults intersect each other at right angles above a square ground-plan. The load is then carried by the four corner-posts or piers. But since the nave is twice as high as the aisles, the so-called engaged Romanesque system becomes a necessity. 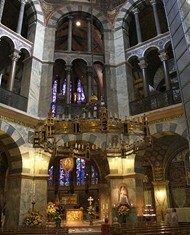 In this the square intersection or crossing determines the span of the rest of the nave, which is intersected at intervals by two bays from the aisles. The columns of the nave which carried the heaviest load were gradually replaced by piers, until Romanesque architects came to use only the latter. As vertical components of the walls they belonged to the body of the building, while the columns were parts of the articulated structure; it was only in the late antique that they were inharmoniously burdened with masses of rising masonry. This substitution of the pier for the column in Romanesque architecture is a simplification comparable to the inclusion of the forecourt of the basilica between the towers, whereby the ancient atrium became the so-called parvis, and the ancient font shrank to the proportions of a holy-water stoup. On the other hand, the old Roman colonnade or peristyle, was revived in the form of the cloister connnecting the church and the monastery. The Romanesque church was almost always connected with a monastic foundation, in which all sorts of rooms were required for the community life of the monks - such as the chapter-hall for assemblies, the refectory for meals, and the dormitory for sleeping. The whole abbey was often surrounded with fortified walls and towers, and constituted a little self-contained city. As a rule, the only departure from the plan of the basilica was the baptistery, which was usually a transeptal building, such as is represented in miniature by the domed reliquary from the Guelph treasury. In the North, however, larger churches, tending toward the cruciform or transeptal plan, were sometimes built over Roman foundations. Such was the church of St Gereon in Cologne. In the case of castle or fortress chapels the form of the double church was adopted in order to save space; here two chapels were built with the same plan, one above the other, the lower of the two often being used as a sepulchral chapel. Examples of this kind are to be seen, above all, in Nuremberg, Eger, and Goslar. The ordinary Romanesque church, where the whole of the chancel, the presbyterium, was raised several steps above the nave, while under it was the krypta, a vaulted crypt, the burial-place of the founders of the church and other notable people, is a variation of this arrangement. From these basic forms, the Romanesque architecture of Europe evolved ever richer, more beautiful and refined methods of construction. The various ways of applying and carrying out these methods in the individual portions of the fabric gave the Romanesque building its special character. The influence of antiquity radiating from the South of France, was felt as far northwards as Cluny in Burgundy, the province on the frontier of the Celtic-French and Germanic populations. In the great Benedictine church at Cluny, begun in 1089, the Southern French barrel-vault was adapted to a cruciform basilica, of the type which had evolved in the North. Only from a reconstruction is it possible to realize the magnificence of this Romanesque building, which rose from the ground-plan of a two-armed cross, with its various towers, crossings and apses, and which, with its five naves and its two transepts, was regarded at the time as the most important church in Christendom. What cannot be seen from the few existing remains may be inferred from the details of the monastic church at Vezelay, the Cathedral of Autun, and other French buildings. Compactness, and a tendency toward systematic sub-division were characteristic of Burgundian Romanesque; this may be seen also in the neighbouring churches of western Switzerland, in the porch of Romainmotier, or the great collegiate church of Payerne. Contemporary Norman buildings are far more primitive-looking. Where southern influences had not penetrated, even after the introduction of stone, the old system of timber construction dictated the form of the structure, and it was not until after the conquest of England in 1066, when the Normans ruled over wide areas of Europe, that their increased self-consciousness found expression in architecture. The conventual churches of Sainte- Trinite and Saint-Etienne at Caen, founded by William the Conqueror and his wife, and erected about this time, concentrate all their strength in the piers and buttresses, the walls being little more than connecting screens. A new chivalric order of architecture had made its appearance, from which the Gothic would presently develop in all parts of Europe. To describe the developments in chronological order: In the German-speaking East, as in Normandy, the ceilings of the basilicas - apart from the crypts and the apses - were for a long time always flat. The collegiate church at Gernrode, founded in 961, like the churches built on the model of the conventional church of St Michael, in Hildesheim, and the great basilica at Hersfeld, are of this type. So are the churches of St Emmeram and St Jacob in Regensburg, and the church of St Peter in Salzburg, which was restored after a fire in 1127; and the cathedral of Gurk in Carinthia. In the Rhineland, in the course of the 11th century, a series of cathedrals was built with vaulted ceilings. In 1016, the old cathedral of Trier was rebuilt; and from the same century date the three magnificent cathedrals of Speyer, Mainz and Worms. As well as the Romanesque ground-plan, imposed by the vault, they had the double chancel characteristic of German churches. This plan was introduced in the famous church of St Gall at the beginning of the ninth century, but is rarely seen south of the Alps, though one example is to be seen at Valpolicella, near Verona. One of the principles of the Romanesque style was to lay the individual stones of ecclesiastical bUildings in closely-set courses; but in Worms we see a tendency - which came to fruition in Bamburg and Naumburg - to soften and enrich the rigid construction by ornamental forms of masonry. The abbey church of Laach, in the Middle Rhine, discarded the conventional system, and to make more space the span of the vaulting was as great in the aisle as in the nave, with the result that the transverse arches of the bays were of different heights. It would take too long to describe these developments in detail. A simplification of the prevailing style was effected in the monastery at Hirsau. The monks, who were trained in the Benedictine traditions of Cluny, always built uniform, flat-ceilinged, triple-naved basilicas, with the arches supported by columns, and without crypts, like the Minster at Schaffhausen. A typical building of the end of the Romanesque period is the Minster at Basle, with a polygonal chancel, a gallery, and a triforium above the arcades of the nave. In the Gothic period it was made wider, with five naves or aisles. Of secular buildings the most important, apart from the first urban dwelling houses, are castles and palaces. A fortified tower, the donjon, rectangular or circular in form, constituted the citadel, the place of refuge. As long as its defensive function dictated its form, aesthetic had to give way to utilitarian considerations. Only after the eleventh century were separate dwelling-houses built inside the larger fortresses and then they were often decorated outside. Especially where the dwelling-house, as a prince's palace, was detached from the fortress and built in the open, as at Gelnhausen, the way was open for artistic developments. In the existing remains at Gelnhausen we see a trefoil arch above the entrance, beside groups of late Romanesque windows, and there is also a Romanesque gate-house, in the upper floor of which Romanesque rose-windows were probably inserted. The ornamental forms applied to secular buildings were those of ecclesiastical architecture. The walls were divided by pilasters, and by the round corbels characteristic of Romanesque art. Dwarf-arched galleries, like those built inside the churches, in the triforium, are often seen on the outside of Romanesque buildings. In these, as in the pillars of the naves, or cloisters we constantly find the Romanesque cushion or cuboid capital. The transition from the round shaft of the column to the square spring of the arch is effected fairly neatly by the interpenetration of cube and sphere. After the middle of the twelfth century, but not before, it was always ornamented. Other artistic features of Romanesque buildings will be considered under the headings of sculpture, painting, carving, etc. Some Neo-Romanesque architecture appeared in America, during the 19th century. Exponents included Richard Upjohn (1802-78), James Renwick (1818-95) and Henry Hobson Richardson (1838-86). Long after the ornamental animal motifs of the period of migrations had been forgotten, sculptured animal forms of all kinds played an important part in the details of Romanesque buildings. In spite of their fantastic character, one can trace a definite development, an approach to greater realism. Nordic fantasies are mingled with the dragons, lions, basilisks and vipers mentioned in the Bible and in ancient fables, as we see them represented in the medieval bestiaries. The carvings so often found on windows, capitals, pedestals, friezes, corbels, tables of arches, and elsewhere, are the prelude, and accompaniment, of the sculpture of the human figure with which Romanesque art enriched the Christian world. The invasion of the cultural area of the Mediterranean by the spiritual power of Islam in the eighth century had finally separated Europe from the Oriental world. While the influence of Islam aroused the first opposition to the veneration of images in Byzantium, Italy refused to take part in the great iconoclastic revolt. Many Byzantine artists, workers in mosaic and carpet-weavers above all, made their way into Italy, bringing wIth them such images of the saints as they could rescue. At this time Italy severed the political bond with Byzantium and elected the Frankish King Charlemagne as the protector of the Italian church. Since the wall-paintings and sculptures of the Carolingian period have almost completely disappeared we know only from written records that the churches of the North were decorated with paintings like those of the South. There were two Northern additions to the iconography of the Italian church: the crucifixion of Christ and the Last Judgment, the latter being a theme which later Romanesque art never tired of representing. Still in rather low relief at first, the figures in the tympana of arches in the early cathedrals are crowded together in confusion. Byzantine taste enclosed the figure of Christ in a mandorla (an elliptical aureole surrounding the whole figure; the word means, in Italian, an almond); the representation is more conventional but at the same time more plastic than was possible within the ancient nimbus. A century later the figures had become less conventional and national differences had modified the details. The figures on the west front of the cathedral of Chartres, which were the work of one of the greatest of the medieval masters, still seem to be fastened to the pillars, but in the altar-front of the time of Henry II the figures begin to step out of the flat surface. Their movement is still spasmodic and uncertain in the chancel screen of the Bamberg cathedral, but only a few years later, in the Adam doorway, they have the free and noble bearing of the figures of Naumberg, with their perfect individuality. These date from the beginning of the Gothic period. Important Romanesque sculptors include: Gislebertus (12th century), Master of Cabestany (12th century), Master Mateo (12th century), and Benedetto Antelami (active 1178-1196). It is difficult to form any comprehensive idea of Romanesque painting, and even harder in the case of the minor arts. At the beginning of the thirteenth century the West was flooded with examples of the minor Byzantine arts; but even before this, ecclesiastical respect for tradition had imposed the forms of early Christian and Byzantine art. This idiom was very evident in Italy and the south of France; in Germany, the north of France and England it was gradually superseded. It is often very difficult to decide what was due to Byzantine influence and what to the individual, Nordic sense of form. For example, the coronation mantle of Henry II is believed to be the product of a Bavarian convent. It was probably women's hands that gave the figures their naively natural attitudes, in spite of the respect for tradition shown by the symmetry of the design. From the early 11th century, Romanesque Churches were painted throughout in order to guide their predominantly illiterate congregations - an artistic evolution exemplified by the mural painting at Cluny (now destroyed). After 1100, this form of decoration spread to Cologne, Bonn and other Rhineland areas of Germany, as well as Spain, where Islamic influences created brighter, more colourful murals. The cloisters on the Island of Reichenau, in Lake Constance, as early as the tenth century an active artistic centre, enable us to form some notion, from the wall-paintings which are still preserved in the church of St George, at Oberzell, of the permanent wall-decorations to be found in almost all the larger churches of the time. The paintings run along the walls between wide borders of scrollwork, and on the mitres of the arches in the arcades the portrait busts of saints, or of superiors of the Order, are set in medallions. Where the pictures are not easily comprehensible they are elucidated by metrical inscriptions, tituli. Romanesque illuminated manuscripts developed alongside murals. But most important was the increased demand from the Cluniac, Cistercian and Benedictine Orders for religious books and Bibles, all of which had to be made by hand. Important illuminated manuscripts included: the Moralia Manuscript (c.1110), Vita Mathildis (c.1110), the St Albans Psalter (1120-30), the Pantheon Bible (c.1125), the Psalter of Henry de Blois (1140-60), the Lambeth Bible (1150), and The Gospel Book of Henry the Lion (c.1170). Important centres involved in the making of illuminated manuscripts included: Citeaux (the first Cistercian monastery), Bury St Edmunds, Helmarshausen monastery, the Meuse river region, and Salzburg. For Gothic-style book illuminations, see: Limbourg Brothers (fl.1390-1416). We must not imagine Romanesque churches as bare, empty buildings. Even the floors and the flat wooden ceilings were not without decoration. In the cathedral of Hildesheim, as in the crypt of St Gereon, in Cologne, there are brightly-coloured mosaic floors. We have an excellent example of the paintings on the oldest ceilings in Poeschel's work in the church of Zillis, in the Grisons. Embroidered carpets and wonderful tapestry art adorned the floors and walls, the altars and stalls. The long, frieze-like Bayeux Tapestry, worked in coloured wools on white linen, which described the conquest of England by the Normans, is one of the best-known examples. Stained-glass windows soon began to replace the tapestries: as early as 1000 the Abbot of Tegernsee boasted of their beauty. In Zurich, at Werden, on the Ruhr, and in many other monasteries, there were stained-glass windows even earlier. It is less easy to say when they were first introduced into France and England, but in the Early Gothic cathedral of Chartres are various medallions rescued from the old Romanesque cathedral, which in their strictly linear designs, have retained a wonderfully luminous colouring. 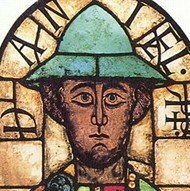 According to written records, Saint Remy, in Reims, had stained-glass windows in the second half of the tenth century. After 1100 their use became general. The key centres for stained glass production during the Romanesque period were located in the Rhineland area, in the Ile de France and Poitiers. 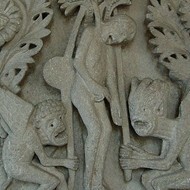 As well as sculpture and stone-carving, the art of ivory carving was practised with enthusiasm in the Romanesque period. Ecclesiastical accessories of all kinds, in particular, reliquaries, which could be set up in the house like little altars - or even carried by the owner when travelling and fine book-covers, and many other treasures, have been preserved. No less important, and no less assiduously practised since the time of the Saxon emperors, was the art of metalwork, in gold, bronze and other precious materials. In Hildesheim, under Bishop Bernward, was a school of bronze-casting, whose masterpieces, the Bernward pillars, the bronze doors of the cathedral, and the font, show how greatly this art, originally of the Age of Migrations, had been refined in the Romanesque period. At first the antique forms and Byzantine attitudes were adopted, but later on there was a new refinement. By the end of the 11th century the peoples of the West had chosen to go their own way, even in the minor arts. From the twelfth century onwards the Crusades, with their flocks of pilgrims, the merchants, the craftsmen who wandered to and fro across the face of Europe, and the troops of stonemasons and goldsmiths who travelled from place to place, were preparing the West for that secularization of art which finally wrested it from the exclusive possession of the monks. NOTE: An important regional school of Romanesque culture emerged in the valley of the River Meuse, during the 11th, 12th and 13th centuries. Centred on the Bishopric of Liege, Belgium, the school of Mosan art took enamelling to new heights, thanks to goldsmiths like Nicholas of Verdun (1156-1232) and Godefroid de Claire (1100-73). First of all, in the minor arts urban industries appeared which rid themselves of the last traces of Byzantine influence, so that even where the church was still the employer, the popular taste had more scope. 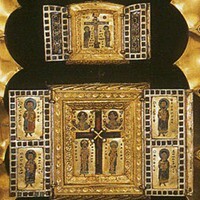 Gold was replaced by copper and bronze; the process of enamelling on copper made possible a more independent and fluid treatment of the metal base and the enamel than was possible with the more costly Byzantine technique. One can see, even in the minor arts, the same sort of liberation that occurred in monumental architecture in the thirteenth century; nothing more or less than the expression of a new spirit, a new taste: the Gothic.  For more about medieval visual arts, see: Homepage.